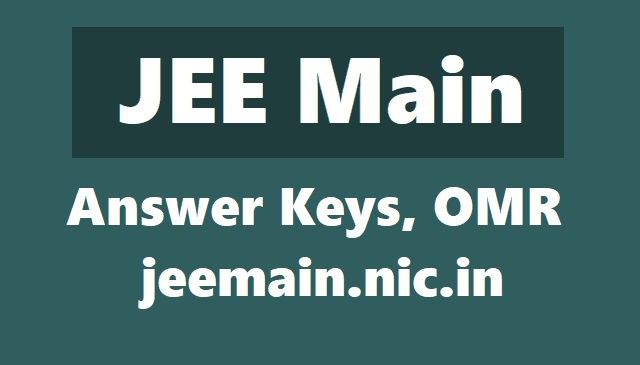 JEE Main Answer Key 2019 - OMR, Question Papers on jeemain.nic.in: JEE Main Answer Key 2018: NTA has released the official notification for the JEE Main 2019 answer key and question paper. As per the official notice,9,41,117 candidates were registered for the examination. The Question paper and answer keys are now available on jeemain.nic.in. Also, please note that the facility to view JEE Main Question Paper and Answer Key would be available from today - Jan. 14 to January 17, 2019. Window would close at 5:00 pm on jeemain.nic.in. Students are advised to check the answer keys and question papers and save the same for future. Faculty to raise objections are expected to be activated later. The online window to raise the objections will be available for a week after the release of answer keys. After verifying the challenged answer key, NTA will release the final answer key. Joint Entrance Examination, JEE Main 2019 answer key are released on the official website. National Testing Agency, NTA has concluded the JEE Main 2019 examination last week. NTA has releaseed the JEE Main 2019 answer key and question paper for candidates. Students who have appeared would be allowed to go through their recorded responses and question papers along with official answer keys. The window to raise objections would also activated along with key on jeemain.nic.in. All students are advised to check the official website jeemain.nic.in regularly for updates. NO personal intimation would be sent to students regarding the release of answer keys or any other updates. The information would also be available on this page. JEE Main 2019 result for January 2019 examination for Paper 1 is scheduled to be released by January 31, 2019. The ranks for JEE Main 2019, however, would only be released after the April session. Students would have an option of appearing in or not appearing in JEE Main 2019. The last date to raise objections against the JEE Main 2019 answer keys is January 17. In order to raise objection against JEE Main 2019 answer keys, the candidates are required to pay online a sum of Rs 1000 (one thousand only) as processing fee for each question challenged. "The payment of the processing fee may be made through Debit/Credit Card/ Net Banking. The processing fee will be refunded if the challenge is found correct. No challenge will be entertained without receipt of processing fee," read the official notice. JEE Main 2019: The JEE (Main) 2019 has been conducted throughout the country and abroad from 8th January to 12th January 2019 through the Computer Based Test (CBT) mode in which 9,41,117 candidates were registered. The Joint Entrance Exam is conducted every year for candidates seeking admissions in undergraduate engineering programmes in the prestigious IITs, NITs, IIITs and various other CFTIs (Centrally Funded Technical Institutions) across the country. JEE Advanced 2019: The Indian Institute of Technology (IIT) Roorkee will conduct the Joint Entrance Examination (JEE) Advanced 2019 on Sunday, May 19, 2019. The entire examination will be conducted in fully computer based test mode. The JEE(Main) January-2019 has been conducted throughout the country and abroad from 08th January 2019 to 12th January 2019 through the Computer Based Test (CBT) mode in which 9,41,117 candidates were registered. The link is available on the website and candidates need to click on it to view their respective question paper and responses.